A lot of salespeople use videos as content when they send email. The traction rate of this new practice is growing extremely quickly in the market and will soon become a top trend. This is something we do here at CloudChoice, and today we are going to show you some valuable tips to get some better videos out there! You definitely need a dedicated video marketing tool. We are currently partnered with Hippo Video, which is an excellent marketing tool. Hippo Video is a valuable tool because covers everything from video creation to editing to hosting and analytics. Analytics are especially valuable because it will allow you to be more of aware of who is actually interested in your product. Advanced analytics can also help you improve your videos by seeing at what points do people lose interest and stop watching. Hippo Video specifically will also notify you when somebody has watched one of your videos, which can inform you which leads are hot and interested, and which may cold and not worth pursuing. Not a lot of people have time to watch a longer 10 minute video. Personal sales videos should be one to three minutes long, enough to cover one topic or point you want to make to the person you are sending the video too. You may have a lot you want to say, but you will get a chance to say that if they are interested. You need to create a short, friendly, brief video to introduce yourself on a personal level. If you don’t use your lead’s name early in the video, you lead will assume that this is a mass-created video sent out to potentially thousands of people. Starting a video with something like “Hello George,” immediately gets people’s attention. They are being addressed by name, which will lend you credibility. That means that your lead is more likely to watch the rest of your video. Do some research on your lead. After addressing them by name, you should introduce yourself personally. Do some research and see what company they are working for, and include that in the video. This is a really big tip which will help you increase your open rate. When you send out a video, mention the word “video” in the subject line of your email. It’s a way to grab your lead’s attention and make them much more likely to not only open your email, but watch the video you have sent them. Tip #6: Use a Video Thumbnail That Is Clickable! Many people may be apprehensive to opening a link in an email – especially if it’s using a video link that isn’t YouTube. Having a video thumbnail in your email is a small change that makes a big difference – people will be more comfortable to click a thumbnail to open a link than opening just a link in their email. Hippo Video currently offers this in Gmail, and will be offering it for Outlook in the future. Tip #7: Don’t Forget The Lighting! What good is a video if people can’t see what you are filming? A poorly lit video looks unprofessional and horrible, and may cause people to click off of your video almost instantly. 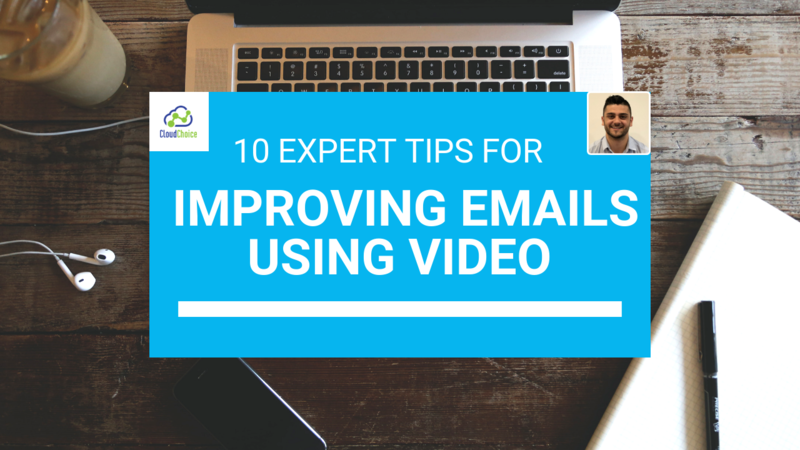 You don’t want to be too pushy in a video email. Start with a personal intro, then offer a personal call or demo. Exactly when you ask is dependant on your personality, style, and sales strategy, but it is always best to push the hard ask back a bit to make your viewers more comfortable. A call to action is a tool that some video tools offer. It is basically, an “ask” or request in the middle of the video to click a link. It could be schedule a demo or call, or a link to your company’s website. If you don’t have a built-in tool, you can get around this by asking people to visit your website or another link you provide in the email. If people are interested in what your video has to say, they may click the link is gently nudged to do so! You’re trying to sell your product, so don’t forget to tell them what it is! Show a very quick, easy, and brief (Tip #2!) overview of what you are trying to sell. You can provide a very quick demonstration on camera, or use an elevator pitch to get your point across. I enjoy making the clients happy and CloudChoice gives me a platform to do just that. I celebrate challenges and so I am your man to reach for solutions to your business problems.